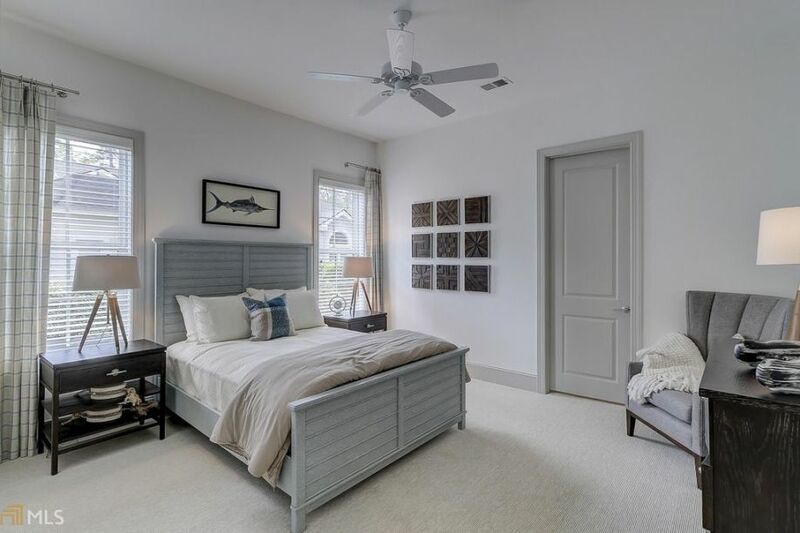 I love master bedroom designs that don’t necessarily commit to one particular style or decor theme. The juxtaposition of designs and trends has always looked very cool to me and allows you to use your creativity and play with unexpected elements. This room is a great example of how you can mix styles without it looking garish or incomplete. 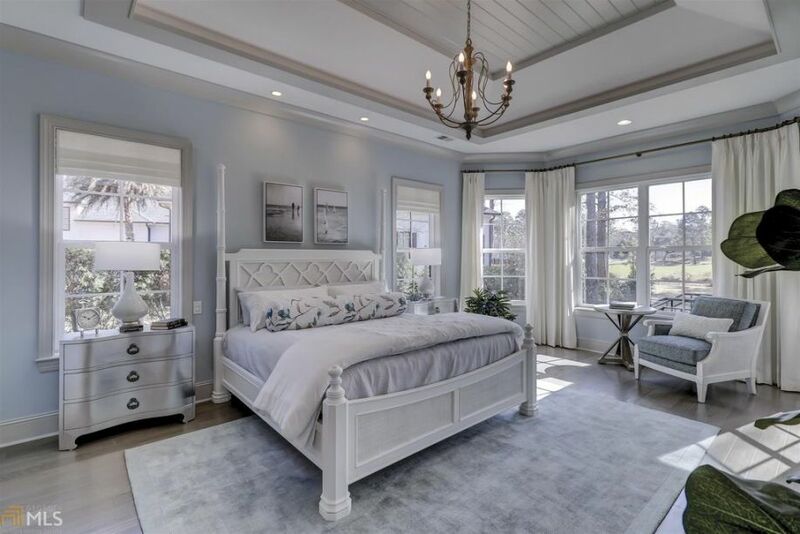 I call this room “glamorous country,” with the cottage style bedroom furniture ideas combined with elegant touches like a beautiful chandelier and modern art. 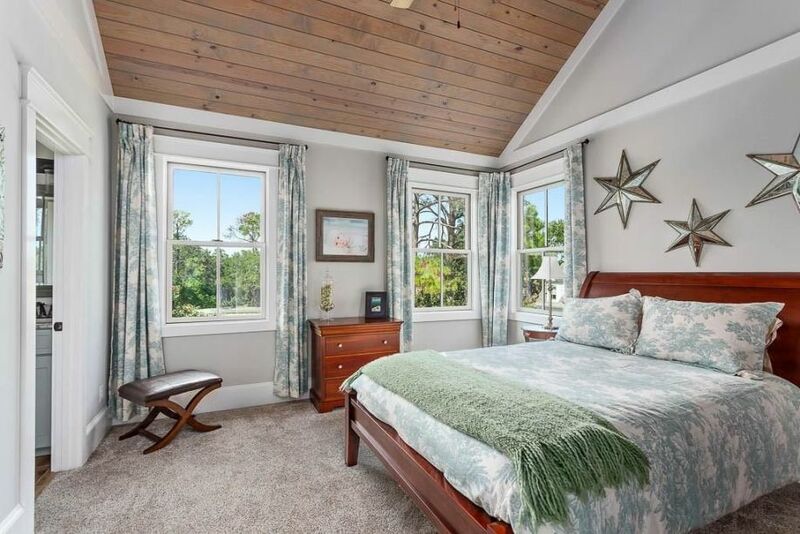 The furniture screams cozy cottage as does the bead board panelled tray ceiling. Choosing the final pieces of bedroom decoration and accessories can be one of those challenging little projects because it is hard to pin point the trinkets and art that will best accentuate your overall design. This homeowner did a great job of selecting items that enhances the underlying style of the space without being too bold or looking out of place. As you can see they went with a subtle coastal or maritime theme, which makes sense that this home is nestled along the coast of Maine. The cloudy grey color palette sets the tone for the room design, and the masculine cottage style furniture further enhances the decor foundation. So many bedroom decor ideas that I see have those "Zen" spa-like minimalistic decor and neutral color palettes of beige, grays and soft blues. For my bedroom interior design, I wanted something that was bold and vibrant, matching my pretty "out there" personality type. I love a good retro orange shade so I opted for a grey and black base for my master, then brought in some pizazz through bold accents of this eye catching shade. In order to blend well with the rest of the home decor ideas I used throughout my condo, I kept a modern rocker theme with lots of mirrored and acrylic accent like you can find in my living room and office. Master bedroom decor can take on many forms, from simple and contemporary to in your face glamorous and everything in between. This is one of those spaces that definitely leans on the boldly chic side of master bedroom design. The focal point of the room definitely has to be the extremely tall vaulted ceiling with large brass chandelier. This is something like what you would see in a grand entryway or formal living room, not in beautiful bedrooms. The designer’s choice to paint the ceiling a deep aqua shade was a fantastic idea because it draws attention to this monstrous architectural feature, but the dark shade tones it down a bit and makes it seem less spacious. 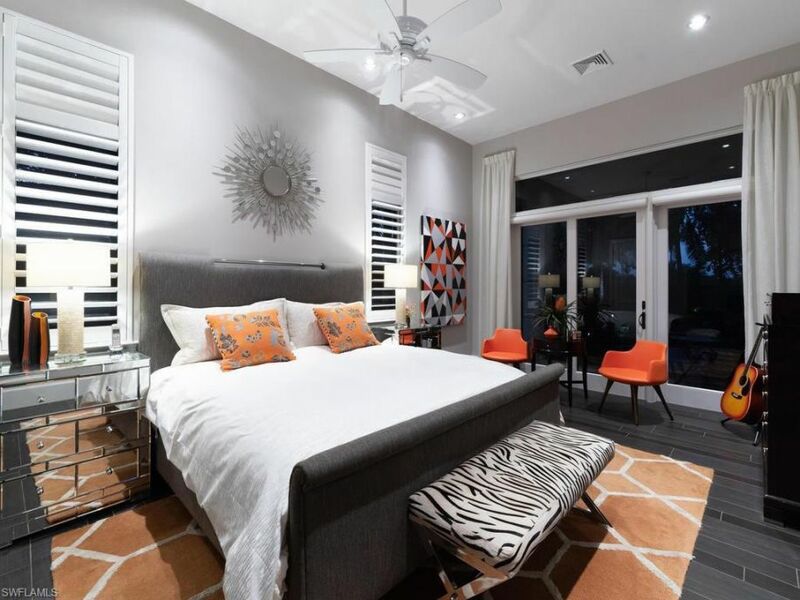 My design partner and I just finished up the master suite makeover and I think that is is filled with bedroom decor ideas that anybody could use to elevate their space to the next level. The best way to start and room decor overhaul is to get inspired. This could be an image like this that you find online and really love, or it could be an awesome throw pillow or piece of art that really speaks to you. With that item in hand, you can base the rest of your master bedroom decorating ideas off of it. For example, the piece that started off the entire design of this room is actually the cool retro area rug beneath the bed. I have been in search of bedroom wall decor ideas that are a bit different than the classic art pieces, wall paper and textiles that you see in most home design magazines. I want something that makes a bold design statement when you walk in the room but is still soft and subtle enough to keep the space relaxing and tranquil. I really like how this designer used whitewashed wood paneling on the ceiling as the major decorative focal point in the space. It gives the decor a unique islandy rustic feel but it is not too much or distracting from the overall look of the bed design and linens. The stain that they chose has the perfect ashy undertone to coordinate with the serene grey wall paint and sage green accents in the draperies.